A teaching manual that should be required reading for all members of any church! 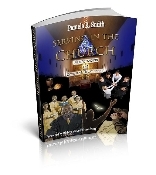 A MUST FOR ALL CHURCH MEMBERS AND CHURCH LEADERS! Serving in the Church is a great teaching tool for Bible classes or group ministries as it walks you through understanding the covenant relationship of church membership. Church membership is entering into a covenant relationship with the body of Christ, a local assembly and its pastor and members. It is saying I want to be a partaker of the church’s vision, purpose, and mission. This teaching manual will help walk you through church membership and its benefits. It helps to shine light on leadership's responsibility as well as lay members'. Serving in the Church will help to strengthen your church and you. It will help to refresh and encourage you in areas where your commitment may have lessened and inspire you where you feel unequipped to respond to the ministry area God has called you to serve. Serving in the Church will also to help re-focus you in areas where you feel burned out or overworked. It is to help bring restoration and to provide a wealth of information to assist you in rising to the challenge of being an effective and consistent laborer in our Father’s vineyard. What Should You Do When Wronged? How Do I Overcome The Spirit of Competition? How Do Leaders Deal with Difficult People?